With the holidays closer than we think, I’m already in the midst of planning my holiday menus. 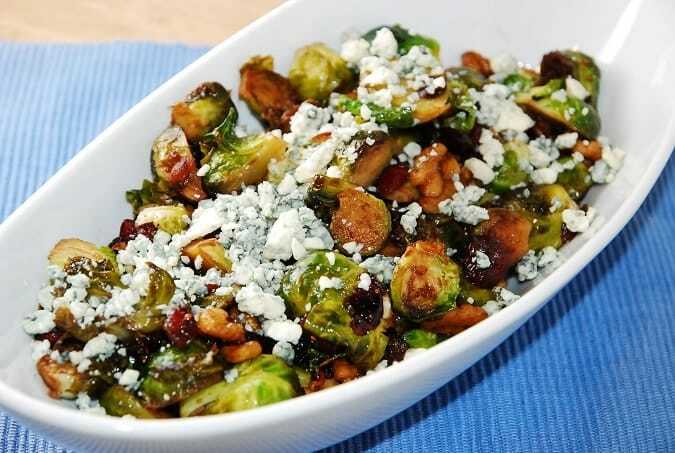 And this Pan-Fried Brussel Sprouts with Cranberries, Walnuts and Blue Cheese Recipe will absolutely be making an appearance on my table this year. It’s such a delicious way to get in those veggie servings, and you get the bonus of the healthy fat and nutrients from the nuts. The sweet dried cranberries, touch of maple syrup, and balsamic vinegar help to take some of the bitterness out of the brussel sprouts too. If you prefer, you could even slice the brussel sprouts thinly, instead of just halving them….this may make it more palatable to the brussel sprout naysayers. So if you haven’t been a fan of brussel sprouts in the past, this may the right recipe to reel you in. But truly, this dish was wonderful, and my husband and I really enjoyed it. These Pan-Fried Brussel Sprouts are truly an excellent Weight Watchers Holiday Recipe idea. Enjoy! Beautiful and decadent, this dressed up brussel sprouts recipe makes a wonderful holiday side dish. It’s quick and easy to make, yet has an impressive appearance and mouthwatering flavor. Varying in tastes and textures, this vegetable dish is a real winner. Spray a large skillet with non-fat cooking spray or an olive oil mister, and set over medium high heat. Add in brussel sprouts with a bit of salt, and cook until brussel sprouts become tender, about 10 minutes. Now stir in dried cranberries, walnuts, maple syrup and balsamic vinegar, making sure to coat everything well, and cook to heat about another 3 minutes. Remove from heat and place in serving bowl. Top with crumbled blue cheese and serve.